Tonight is a wonderful night. It’s a quieter night. Everything is closed. The streets are bright with Christmas lights and trees in everyone’s homes. It just seems so peaceful. Then we come into the church, and it too is all lit up and bright. But at the same time, there’s a peacefulness here as well. Even with the crowd and shuffling about in the pews we feel that peacefulness, don’t we! We come and we hear that old, old story again about Mary and Joseph heading to Bethlehem. Mary is very pregnant on this journey, carrying God’s Son within her. We hear about how they found an unexpected place, a manger, where their special son is born. We also hear about the shepherds, who hear the angels proclaim the good news of the birth of the Saviour. They too make their way to the manger to witness the child born for all humankind. We spend so much energy on preparing for this night. All the decorating. All the baking. All the shopping. All the wrapping. We want this day to be very special. And we should! I’m not saying there’s anything wrong with that, although maybe some people do take it a little over the top. We do so much to celebrate Christmas, when it began as a man and woman, far from home, no family around them, no trees or gifts. Just each other and their new born child. Followed by some strangers coming by to pay their respects. We sometimes forget the simplicity of the first Christmas. But it really was very simple. We’ve built it up to a great celebration, and it should be, because we are celebrating a gift given for the entire world, the child who would grow to be the one who saves all people and brings them into God’s family through himself. We have been given a gift. A gift that lasts beyond just tonight. It is a gift which lasts for all eternity. A gift of a life with God through our relationship with this baby. Tomorrow morning we will get up and open some gifts. We will spend time with family. We may go do some visiting. We may have some visitors. We will celebrate the gift of life and happiness. What if we were able to celebrate this gift of life and happiness every day? What if we wake up each morning and realize the blessings that are all around us? Our families. Our home. Our belongings. Our friendships. Our workplace. Our town. All of these are a gift, a blessing each and every day. 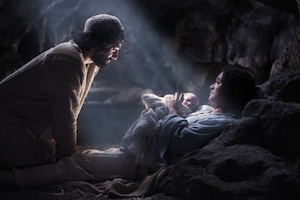 What if we also remember the gift of the child born in a manger? What if we realize he came not just on December 25, but comes to us each and every day as well? He is the gift who will keep on giving. The little baby Jesus grows to be a great man. A man who teaches us and shows us how live as God intends us to live. A man who will give his life, not just for his friends, but for all people of all time and all places. He gives his life so that we may know God even more. It’s true! Jesus gives his life so we may know that God forgives us and loves us. Christmas is a wonderful time to reflect on what this child has come to do. It’s hard to imagine this little baby will grow to change the entire world, but that is what he did. He changed it so much that our calendars were rewritten to remember his birth. And here we are tonight, some 2018 years after his birth, still remembering, still reflecting. Still pondering the impact his life has on our churches, our world, and maybe most importantly, our lives today. What if… what if we remember the impact Jesus has on the world each and every day? What if we let him lead us and guide us through his teachings and his examples of how to love each other? What kind of world would we live in if that’s the example we followed? What if? Mary and Joseph. I wonder sometimes if they were scared? I remember when Bev and I were preparing for our first child. I remember wondering if I would have any clue as to how to be a father. I remember feeling worried about whether we had everything we would need. I remember worrying at times about whether or not we could keep this child alive and safe! 14 years later, I think it’s safe to say we did ok! Bev and I had all the modern conveniences at our fingertips. We had a real advantage over Mary and Joseph. We had a home. We were near family. We had a doctor nearby. We had lots of food. Mary and Joseph had none of these things. They were away from home and family. They only had what they could carry with them, and trusted in those they met on their journey to help provide food and shelter. And certainly medicine was not anywhere near what we enjoy today. Jesus was born into difficult circumstances. But he had two parents who loved him very much. Two very special people who were chosen personally by God to raise His Son. God gave them all they needed. Which was each other and his divine guidance. Jesus Christ, Son of God, son of Mary and Joseph… he came to this world to save us. He came to save us from sin. He came to save us from death. He came to save us from ourselves as we often choose to worship other things before him. Those shepherds though. They also had it pretty rough. The lived in the fields with their sheep. All day, all night, every day, their companions in life were animals. What if they were chosen for a reason to receive the Good News of a Saviour born? Well, they were! These poor men, lonely men, were chosen to be the first witnesses of the birth of a king! There’s a purpose for this. What if Jesus was born in a castle instead? What if his first visitors were royalty with gifts of great treasures? What kind of message would that send to us tonight? How does this signify who he was sent for? There’s a reason, I believe, for this humble and lowly birth. There’s a reason he was born in the middle of nowhere, away from the city, away from the influence and royalty. The reason is because he didn’t come just for them. Jesus came for everyone, but most assuredly for those who are alone and weak and even afraid. He came for people like Mary and Joseph. He came for people like the shepherds. He came to give hope to all of them that God has not forgotten them, even when it looks like the kings and rulers, the governments of the day have forgotten them. Jesus also came for the people of Cape Breton. Did you know that? He came for us here tonight. It’s true! The birth of Jesus gives hope. It signifies God’s love for all people, of all time, of all places and races. God loves everyone, and he wants us to know it. So he chose Mary and Joseph to be parents to his child. He chose shepherds to be the first to visit this child. He chose us to also hear the Good News of this birth. A birth which leads to a life of blessing for all who know Jesus as Lord and Saviour of their lives. What if we allow this Good News to live in our hearts, not just tonight, but next week, next month and all the year through? What impact does that have on us each and every day? Jesus Christ is born for you. No matter how much money you have in the bank, no matter where you live or where you work. No matter your age, your health or your social status… Jesus is born for you so you may know there is a Father in heaven who loves you more than you can ever know. This is the gift of Christmas we receive this night. On this celebration of your holy birth, we welcome you. We welcome you in our lives as our Lord and Saviour. We welcome you as our teacher and our guide. We welcome you into all of our lives so that we may receive the hope and love you have for us. As we receive this hope and love, we ask you to help us share it with others who also need this same hope and love in their own lives. Hope and love only you can give. A hope and love which transforms all who receive it into children of our Father in heaven. Be with us Lord Jesus, we ask on this very special and holy night. We pray in your Holy Name. Amen and amen. Rev Nick, that was/is awesome, perfect and true.